Loudonville, NY. 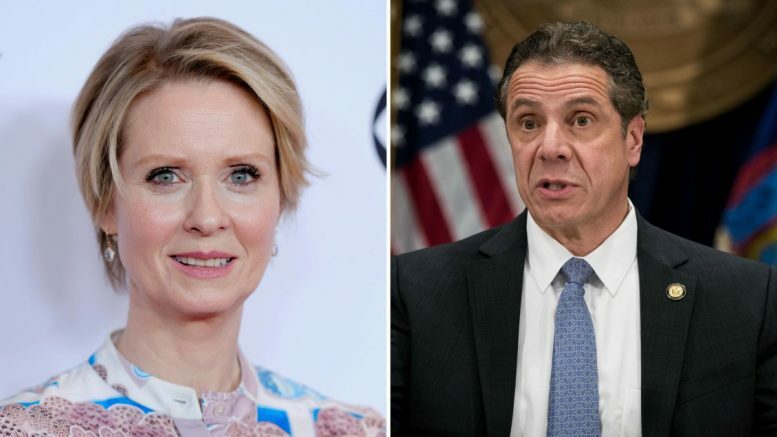 Just days before Democrats choose their nominees for Governor, Lieutenant Governor and Attorney General, Governor Andrew Cuomo has extended his lead over Cynthia Nixon. Cuomo leads Nixon 63-22 percent, up from 60-29 percent at the end of July, according to a new Siena College poll of likely Democratic primary voters. Cuomo’s favorability rating stands at 68-24 percent, up from 67-29 percent in July, while Nixon’s 41-33 percent favorability rating has slipped from 43-30 percent. The race for the Democratic nomination for Attorney General is wide open as Representative Sean Patrick Maloney has the support of 25 percent of likely Democrats, New York City Public Advocate Letitia James has the support of 24 percent of likely voters, Zephyr Teachout has the support of 18 percent, and Leecia Eve trails far behind with three percent support. Lieutenant Governor Kathy Hochul leads New York City Councilman Jumaane Williams 43-21 percent, up from 30-21 percent in July, although 35 percent remain undecided. “Cuomo has expanded his two-to-one lead in July and now seems poised to overwhelm Nixon in Thursday’s Democratic primary. With a lead of nearly 40 points among all likely voters, Cuomo has a lead of at least 20 points with every demographic group and leads by at least 30 points in every region of the state,” said Siena College pollster Steven Greenberg. “While the Nixon campaign has talked about increased turnout among new, young and more progressive voters, it doesn’t appear that that will help her – even if an increase in turnout among those groups occurs. Cuomo has a lead of more than two-to-one, 59-28 percent, with voters under 35 years old and he has an even larger lead among self-described liberals, 65-24 percent,” Greenberg said. “There is also a sizable gender gap as Cuomo leads by 31 points with men and an even larger 48 points with women. “Nearly 90 percent of Democrats supporting Cuomo say they are voting for him more than voting against Nixon, however, half of Nixon voters say their vote is more against Cuomo than it is for her,” Greenberg said. 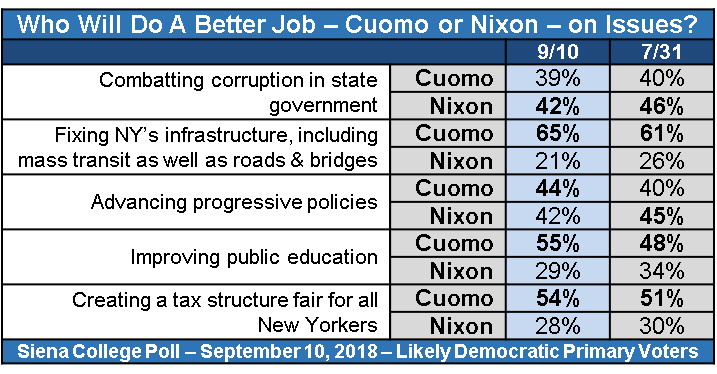 “By 26-point margins Democrats say Cuomo would be better than Nixon on improving public education and creating fair tax policies. They say he would be better on infrastructure, including mass transit, by 44 points. And while closely divided on two issues, they give a small nod to Cuomo on advancing progressive policies and a small nod to Nixon on combatting corruption in state government,” Greenberg said. Maloney has a 35-13 percent favorability rating, up from 21-12 percent in July. James has a 37-10 percent favorability rating, essentially unchanged from 36-10 percent in July. Teachout’s favorability rating is 30-11 percent, up a little from 27-12 percent in July. Eve is at 12-8 percent, largely unmoved from 9-7 percent in July. “James has a significant lead in New York City – which is likely to account for about half of primary voters – a similar lead with voters under 35 and with Latino voters. She has a commanding lead with black voters, having the support of 58 percent, with Maloney in a distant second at 12 percent,” Greenberg said. “Maloney leads by seven points over Teachout upstate, with James a distant third, and has a significant lead in the downstate suburbs, with James 20 points back and Teachout right behind her. “Liberals could not be more closely divided, with 24 percent supporting Maloney, 24 percent supporting Teachout and 23 percent supporting James,” Greenberg said. “Among men, Maloney leads James by four points with Teachout six points behind James. Women are also closely divided, with 25 percent supporting James and 24 percent supporting Maloney; Teachout has 18 percent support. “Democrats supporting Cuomo for Governor give James the edge over Maloney 28-25 percent, with Teachout at 13 percent. Those supporting Nixon are closely divided between Teachout at 30 percent and Maloney at 29 percent; James runs third with 20 percent,” Greenberg said. Hochul has a 35-12-54 percent favorability rating, up from 21-11-68 percent in July, compared to Williams’ 22-9-69 percent favorability rating, largely unchanged from 20-8-72 percent in July. “While Hochul has a two-to-one lead over Williams – up from a nine-point lead in July – she is still well shy of the 50 percent plus one needed to win the race, as 35 percent of Democrats remain undecided,” Greenberg said. “It’s not particularly surprising that there is such a large undecided bloc this late in the race given how little voters know about both candidates. Hochul has become a little bit more well known over the last several weeks but she remains largely unknown to more than half, as Williams remains largely unknown to more than two-thirds. This Siena College Poll was conducted September 4-7, 2018 by telephone calls conducted in English to 509 likely New York State Democratic primary voters. It has an overall margin of error of +/- 4.3 percentage points including the design effects resulting from weighting. Sampling was conducted via a stratified dual frame sample of landline and cell phone telephone numbers from the L-2 Voter list. A likely-to-vote probability was computed for each respondent based on both their stated likelihood to vote as well as by virtue of the imputation of a turnout probability score based on past voting behavior. This probability to vote was applied as a weight along with a weight that considered historic-by-region turnout, age and gender. Polling support was provided by PORL at the University of North Florida. The Siena College Research Institute, directed by Donald Levy, Ph.D., conducts political, economic, social and cultural research primarily in NYS. SCRI, an independent, non-partisan research institute, subscribes to the American Association of Public Opinion Research Code of Professional Ethics and Practices. For more information, call Steve Greenberg at (518) 469-9858. For survey cross-tabs: www.Siena.edu/SCRI/SNY.